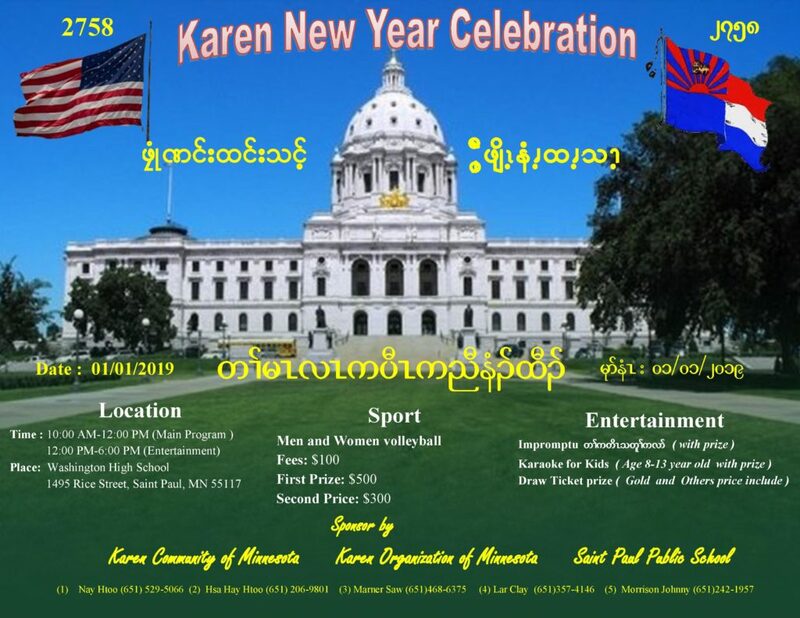 Join us on Tuesday, January 1st, 2019 for the 2758 Karen New Year Celebration at Washington Tech Magnet School. The main program runs from 10 am to 12 pm, and the entertainment continues from 12 pm to 6 pm. There will be speeches, men and women’s volleyball tournaments, a karaoke competition for kids, raffle prizes, and an improve competition. For the past few years, the Karen New Year in St. Paul has drawn over 1,000 people. Be a part of the celebration, you don’t want to miss it! We are also accepting sponsors for the 2758 Karen New Year, the last day to submit a sponsor form and payment is Wednesday, December 26th. Your sponsorship will show your agency’s support for the Karen community and keep this event free and accessible for all community members. More information about the sponsor packages can be found here. To sponsor, complete this Sponsor Registration Form then make a secure payment below (via Paypal). Thank you!